The other day, I found this poster outside my client site. And today, I googled it. What I found looks like a saga of exploitation - of people and of the law. It is also a saga of terrorism, international intrigue, the North-South divide, the Bolivian Navy, and the one person who knows anything about navies in Mongolia. 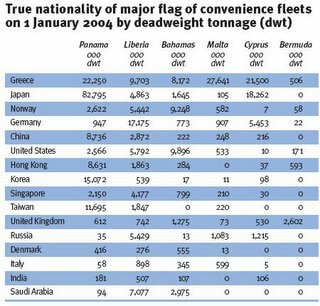 In short, the Flags of Convenience (FOC) system is one where ships of one country fly a flag of another. 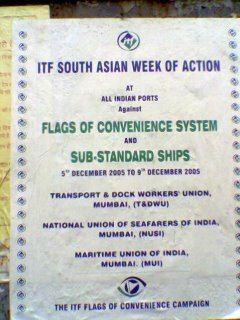 Since maritime tradition follows the rule of the flag - the flag flown by a ship determines the source of law to be applied in admiralty cases, regardless of which court has personal jurisdiction over the parties, shipowners take advantage of lax labour laws/ lower taxes/ poor safety standards in the FOC countries and register their ships there. The problem's big. "Today, approximately 562 oceangoing vessels in the U.S.-foreign trade are owned by U.S. companies flying a foreign flag and crewed by a plethora of foreign seamen, while only 147 fly the American flag and are crewed by American seamen"
"No one pretends that a ship comes from the home port painted on its stern, or that it has ever been anywhere near. Panama is the largest maritime nation on earth, followed by bloody Liberia, which hardly exists. No coastline is required either. There are ships that hail from La Paz, in landlocked Bolivia. There are ships that hail from the Mongolian desert. Moreover, the registries themselves are rarely based in the countries whose names they carry: Panama is considered to be an old-fashioned "flag" because its consulates handle the paperwork and collect the registration fees, but "Liberia" is run by a company in Virginia, "Cambodia" by another in South Korea, and the proud and independent "Bahamas" by a group in the City of London." FOC not only leads to reduction in revenue for the countries which have fair labour laws and safety standards, it also creates substandard conditions for the workers (unpaid, unsafe, unprotected, undervalued) and are major cause of accidents (In 2001, 63 per cent of all losses in absolute tonnage terms were accounted for by just 13 FOC registers). And if you think that FOC countries are small, poor and/ or 'lawless' - Panama, Liberia, Burma, Cayman Islands etc., think again. At various times, Germany, Denmark and the US state of Delaware have been part of FOC list. In fact, perennials like Gibraltar and Bermuda are a part of the Queen's dominions. In any case, the benificiaries of FOC ships are spread across the business world. 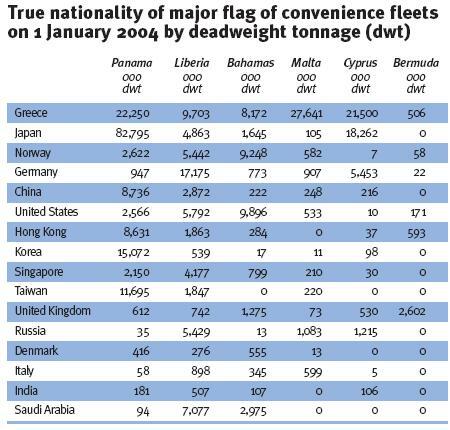 Any country which uses ships uses FOC ships - after all it makes business sense (see pic). "It was America, after all, that helped Liberia to create its “open” register as an alternative to Panama, the first FOC, in the late 1940s. American oil companies, with Greek shipowners riding piggyback, switched their tanker fleets to Liberia to avoid high labour costs at home (American-registered ships are required by law to use expensive American crews). Liberia's success spawned many imitators: “free flags” are now flown by such unlikely places as Cambodia and landlocked Bolivia. China is a big user of FOCs, its main preference being Panama, the world's biggest FOC by tonnage. Panama is also among the most delinquent of FOCs. For instance, it blatantly disregards an international law requiring reports of casualty investigations to be filed with the IMO*. The agency cannot force its members to apply the laws they have passed. The best it has come up with is a toothless system of self-audits. There is a further irony: the IMO's limited powers are the result of American meddling with its constitution in the 1950s, which gave voting powers to countries by registered tonnage rather than by goods actually traded. Liberia (America's proxy) and Panama won seats at the top table, but also became liable for a greater share of the IMO's budget. Late payments by the two have bedevilled the agency ever since." The problem does provides its ridiculous moments. Like the Bolivian defence ministry, which has launched its FOC. This is to ensure proper co-ordination between the FOC department and the Navy. Now all that the Bolivian Navy has is patrol boats. However, the lack of ships doesn't prevent it from aspiring for the sea and share of its profits. We should be smiling at such incidents, if only the problem hadn't spread its tentacles and become highly dangerous. Cambodian ships have been found with cocaine on board. Mongolia has found a niche in North Korean shipping and illegal logging. LTTE has 11 ships under FOC and Osama bin Laden is suspected to have fleets roaming the high seas. Some arms and explosives have been caught, while others surely get away. "The Americans are not the first to want FOCs hauled down. 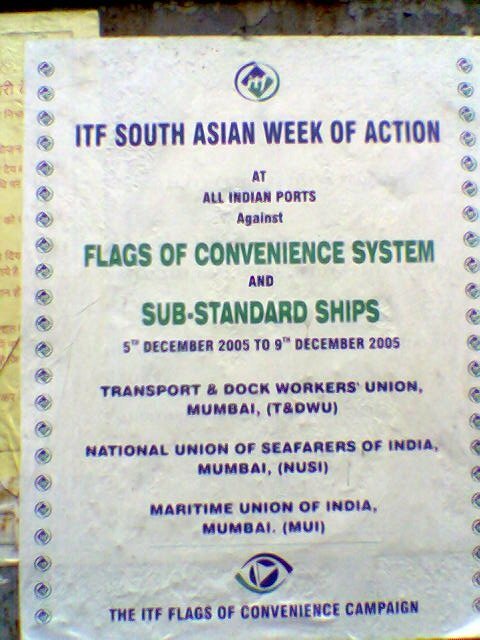 Opposition in the 1970s from transport unions and poor countries led to a proposal for a UN convention on the registration of ships, which would have imposed such strict conditions that FOCs would no longer be viable. The convention was shelved, however, when OECD countries, supported by most shipowners, ganged up on it." Wonder whether the current efforts will yield anything. Wonder whether the people who put up the poster and took part in the Week of Action knew about what they were up against. I, for one, definitely never knew that the poster had such pedigree. * IMO, by the way, is International Maritime Organisation, an UN organisation. P.S. The Mongolian navy's story can be found here and here. P.P.S. Anand had found out about FOC last year. 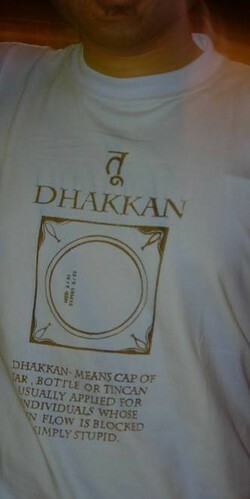 But that was regarding a flag we bought together in Alang. Alang is in the news now. Safety standards again.